Reflections on Teaching » Blog Archive » What’s the part of white privilege that wasn’t clear? What’s the part of white privilege that wasn’t clear? Jose Luis Vilson has been picking at the scab of race around issues in ed reform recently. This post about the “white suburban mom” gaffe US Secretary of Education Duncan last week showed that some folks were not in favor of contextualizing both the original comment, and the public response, in terms of race. I understand where Mr. Vilson is coming from. I corrected some folks when this broke on social media last weekend about whether calling moms “white” was racists because if he had said “black” moms, it would have been. I can’t even picture the Secretary saying that, not because of the potential offense it would cause, but because he doesn’t even feel he has to address their concerns. 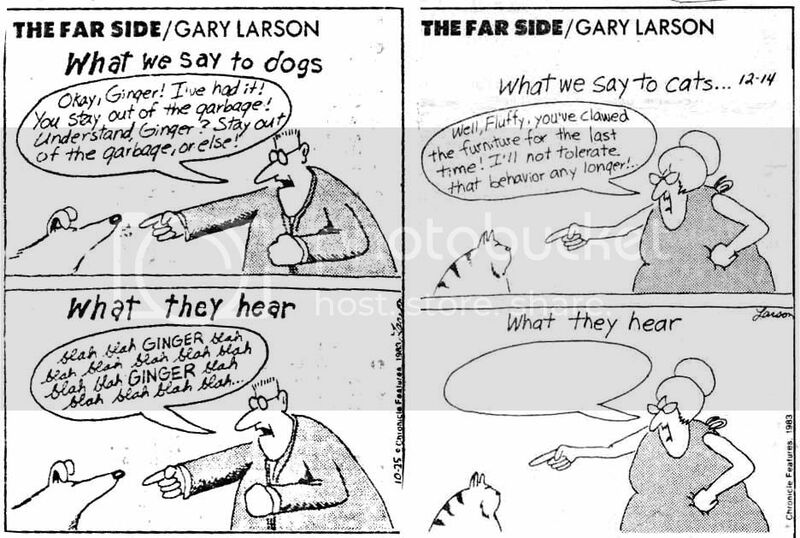 The Gary Larsen cartoon above is a pretty good depiction of the dynamic. When white suburban moms speak, it’s like the owner talking to a dog (in this case, Education Secretary Duncan). “Blah, blah, Common Core, blah, blah” is what Duncan hears. But, when black parents speak to Duncan, he’s just like a cat. Their words don’t even exist to him. Am I mad about what Duncan said? Heck yes! While I sincerely hope that alienating white suburban females will be the straw that broke the camel’s back of this Secretary of Education, I know he’s done a lot more, and a lot worse than this to black and brown children, families, and neighborhoods (which Julian Vasquez Heilig conveniently lists here).